On the ground floor of 3D printing technology for years, aerospace manufacturers first began adopting the various additive manufacturing (AM) processes for use in prototyping. With each advance in the technology, they have been there as AM was used for the creation of tooling to, most recently, the mass manufacturing of end parts. GE increased its role in the industry dramatically when it acquired two metal 3D printer manufacturers and formed GE Additive. GE, however, isn’t the only aerospace company that’s taken AM to the skies. Also ahead of the pack is Boeing, which has been flying 3D-printed parts since 2003. As a manufacturer with a leading role in the 3D printing space, Boeing may be able to offer key insight into the various platforms that make up AM and how they are currently being used in aerospace, as well as how they can and will be used in the industry in the future. To gain some of this insight, ENGINEERING.com spoke to Leo Christodoulou, director of Structures and Materials, Enterprise Operations and Technology at Boeing. As the number two federal contractor, behind Lockheed Martin, Boeing was awarded over $16 billion in taxpayer funds in 2015. Being so closely tied to the federal government has historically given the aerospace manufacturer access to some of the Department of Defense’s leading projects. In 2003, for instance, Boeing was a part of a U.S. Air Force Research Laboratory effort to qualify and fly a metal 3D-printed part on the F-15 fighter jet. The project arose when a replacement part was needed, but the lead time for tooling would be too long. Additionally, the part was going to be made from titanium, rather than with aluminum forging, as had been the case in the past. 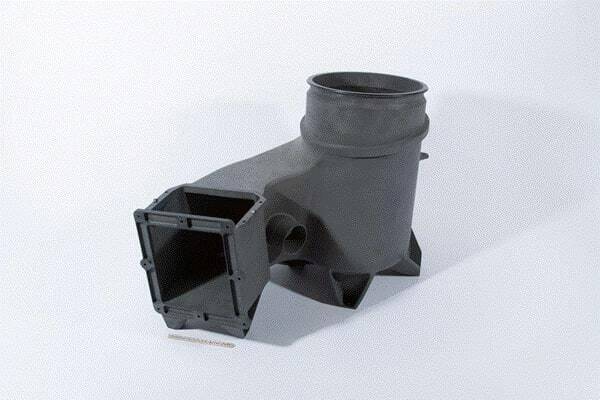 This would reduce corrosion fatigue associated with the aluminum part. To produce the titanium pylon rib, a laser powder feed deposition process, a form of directed energy deposition (DED), was used. The part became the first 3D-printed metal part to qualify and fly on a military aircraft. Almost 14 years later, Boeing now has over 50,000 3D-printed components of various types flying on aircraft today. As if reliving the past, Boeing is turning to DED once again to produce structural components for its 787 Dreamliner. 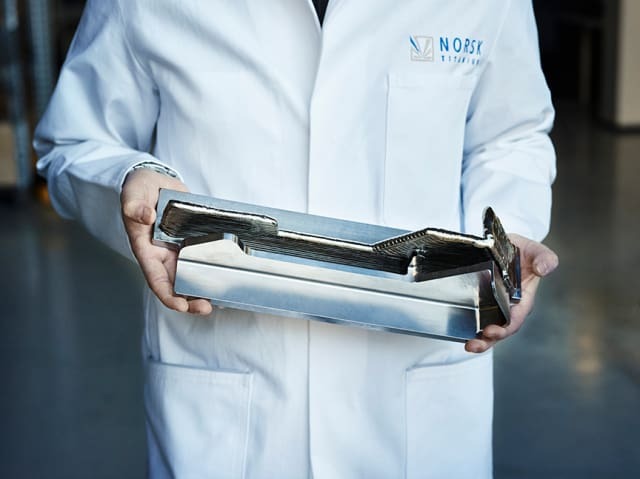 Working with Norsk Titanium and its rapid plasma deposition technology, the company will 3D print what could be the first titanium structural components for an aircraft. Boeing and Norsk have been working together since 2016 to first see if the parts produced by Norsk could meet Boeing’s requirements, and then whether they could meet those of the Federal Aviation Administration (FAA) program. The companies are anticipating that additional FAA approval for the material properties and manufacturing process will be obtained this year. DED processes do not offer the same geometric complexity as selective laser melting, but, by 3D printing near-net-shape parts and then machining them to their final shape, it’s possible to speed up turnaround time, reduce material waste and reduce costs. This may be clearly demonstrated with the 787 Dreamliner. By leveraging plasma deposition from Norsk, Boeing aims to cut costs by $2 to $3 million. Although DED may have been one of the first technologies that Boeing leveraged for the production of an end part, it has become just one of many within the company’s repertoire, according to Christodoulou. “AM for us is a toolbox in a toolbox. AM is not really one single technology. It’s a range of technologies. These technologies are applied differently in polymeric systems, composites, metals, and potentially ceramics. Different classes of material employ different processes, and each material class has multiple processes that one might consider,” Christodoulou said. Among the other AM tools in Boeing’s toolbox is fused deposition modeling from Stratasys. The company has been working with Stratasys to develop its Infinite Build technology, which has a hypothetically infinite build direction on the horizontal axis. The aim for using a technology that is capable of producing such large components may not be for 3D printing end parts necessarily, but also manufacturing aids. Last year, Boeing and Oak Ridge National Laboratory (ORNL) won a Guinness World Record for producing the largest solid 3D-printed item. It wasn’t an aircraft wing that the partners printed, but a large piece of tooling used to secure the 777X composite wing skin for drilling and machining. The machine used to produce the part was the Big Area Additive Manufacturing (BAAM) system from Cincinnati Inc. Although the BAAM is relatively new, Boeing doesn’t just use any new 3D printer to make parts for the sheer novelty and marketability of it. According to Christodoulou, every technology and part goes through a rigorous quality control process. One of the key elements in Boeing’s development and adoption programs is the ability to demonstrate reproducibility. This holds true not just for AM, but for all of its manufacturing tools. Christodoulou said that Boeing has very stringent process specifications for how to build a given part and the settings on the machines. Once stability has been demonstrated across processes on multiple machines and in multiple installations across the globe, the company develops a database compiling the properties of parts. This enables Boeing to have data that supports the use of a particular process to manufacture a specific component. This is true not just for processes, but for materials as well. Among the most recent materials Boeing is experimenting with OXPEKK, a form of laser sintered polyetherketoneketone developed by Oxford Performance Materials (OPM). OPM will be supplying over 600 parts for the Boeing Crew Space Transportation (CST)-100 Starliner spacecraft, which is meant to carry up to seven passengers—or a combination of crew and cargo—to low-Earth orbit destinations like the International Space Station. And while Boeing is qualifying processes on the production front, one of the biggest challenges according to Christodoulou is in the culture of manufacturing and design. This is because industry has become accustomed to designing for existing production technologies. 3D printing, however, opens up the ability to produce parts that were impossible to make with traditional techniques, such as complex geometries with internal structures. Unlike other aerospace companies adopting AM technology, Boeing doesn’t rely entirely on in-house production, Christodoulou pointed out. Instead, Boeing tries to strike a balance between in-house work and leveraging its supply chain. Additionally, Boeing is not a machine manufacturer, like GE. So, while it may make sense for GE to acquire 3D printer manufacturers like Arcam and Concept Laser, Boeing does not plan to build and sell AM machines.